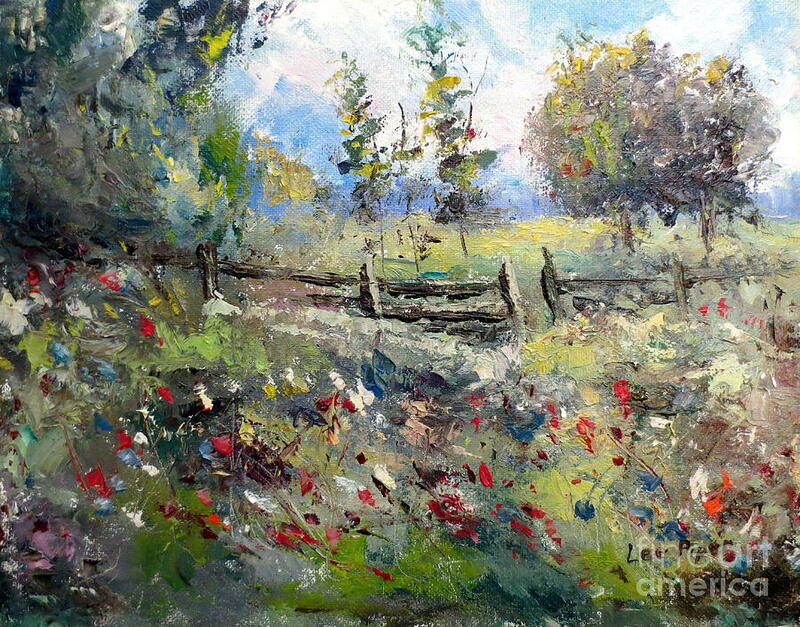 Pasture With Fence is a painting by Lee Piper which was uploaded on January 20th, 2013. An old fence with the gate slightly open beckons to the viewer to come on in. Distant fields past the open fence are over grown and unkempt. The small saplings growing in the field indicate that the field has not been farmed in years. Flowers in the foreground cover the unused two track lane once used by a long gone farmer. 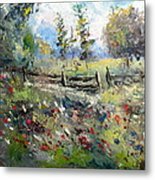 Shade trees frame the left side of the painting while the right side past the fence allows the viewer to see a great distance past the fence. Open sky in the distance open up the scene with a feeling of freedom and contentment. A lush landscape covers most of the painting with bright greens, reds, yellows, blues and dark shaded areas. 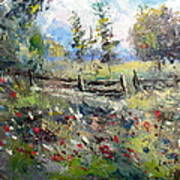 The bright blue sky and summer clouds in the background finish the scene. 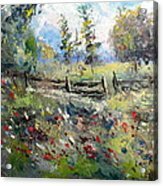 This painting is protected under copyright. And, THIS is where I would be found with a magnifying glass checking out the wildflowers! There is something soothing and freeing about Nature having the last word in a meadow that has the grass smelling sweeter, the birds singing clearer, the colours shining brighter and the cloud filled sky seeming bluer!! And after the deLIGHT, there was the promise of something home grown at my pepere’s hand and hime cooked by my memere’s! Those were the Magical moments of youth one day a week! Memories! Loving your work Lee. Beautiful textures, atmosphere and colors. F/L. Oo my god .. fantastic . So loose and impressionistic. Wonderful work. Charming place, and so beautiful style, Lee !! this is fabulous. Fav of the day - Women Painters! Lee, VERY NICE! Love that style! Love this. Loose and energetic!